Richly endowed by nature, the Deep South state of Georgia works hard to make its hospitality standards worthy of its fabulous forests, coastal lagoons, islands, mountains and wealth of historical attractions. The effort has paid off magnificently; this largely rural corner of Dixieland is a visitors' delight, offering almost unlimited variety. The best places to stay in Georgia put you in easy reach of something for everyone when it comes to family holiday fun..
With its pleasant, though sometimes sultry, subtropical climate, Georgia is one of the USA’s agricultural breadbaskets, hence the use of the peach as the state symbol. Fruit , cereals and greens all grow in profusion and this landscape perfectly sets off the elegance and beauty of the stately antebellum (pre-Civil War) architecture which has a flavour all its own. Northerners – including President Franklin Delano Roosevelt who for years enjoyed R&R at Warm Springs GA – discovered the delights of Georgia as a place to warm the bones. Today’s visitors are not content to stay static in one place, and why should they? Not when the opportunities – rafting, hiking, biking, live music and golfing among many others – are available to such a magnificent standard. World of Coca-Cola: It helps if you like the stuff, but even so, this is a fascinating family trip looking into the rise of the world’s most popular soft drink and the business branding phenomenon surrounding it. Stone Mountain: Georgia had a starring role in the US Civil War (1861-865) and Confederate monuments are everywhere. None more spectacular than Stone Mountain, the somewhat controversial giant relief carving of the South’s great military heroes. Georgia Aquarium: One of America’s finest. A great way to keep everyone amused in Atlanta. Leaders in conservation as well as presenting sea life in the most entertaining way. 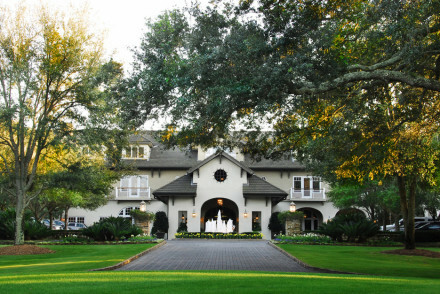 Golfers can rave about St Simon's Island where every property has its own course. Atlanta is one of America’s most progressive cities, while the coastal centres like Savannah are a byword for old world elegance but it’s the landscape, with a profusion of magnolia and host of other flowers that will inspire you to go out and explore for yourself. Our pick of the best places to stay in Georgia has something to suit all tastes from luxurious city pads to beach side resorts and charming B&Bs. 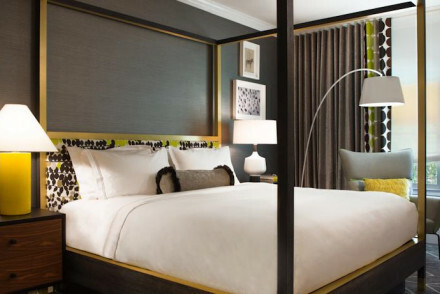 The Mandarin Oriental Atlanta offers all the top grade quality and luxury you would expect from this upmarket brand, but with an overlay of Southern charm and smooth sophistication. 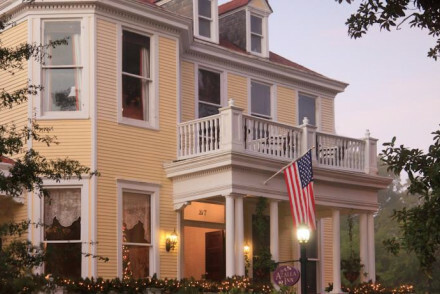 Ballastone Inn, a B&B in the heart of Savannah Historical District is romantic and intimate. Unique rooms have four-poster beds, plush linens and private bathrooms. Breakfast is a southern affair for all guests. In the evening the bar awaits. A great location that is ideal for exploring the city on foot. If you're after a lively property The Brice is a Coca-Cola top shop turned into a contemporary landmark on the heels of Jackson Square. Large rooms offer all mod-cons and city views, marble bathrooms and access to library, pool and business facilities. Pacci serves Italian cuisine and the bar is great for a nightcap. Explore by bike or on foot. 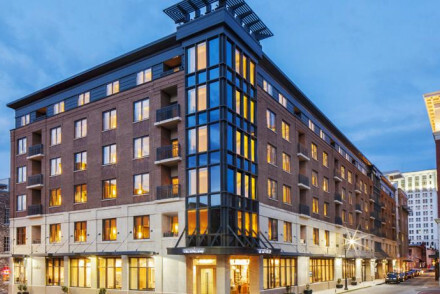 Ideally located River Street Inn is an 1817 former cotton store overlooking the Savannah River, historical architecture meets contemporary luxury. Large and light rooms wrapped around a central atrium with private balconies. Bernie's offers seafood and local cuisine accompanied with live music and fine bar selection. A prime spot in town. 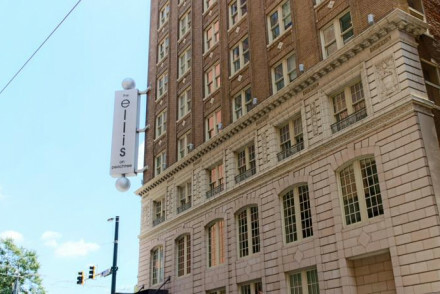 If you're after a chic and central property, The Ellis is a stylish, boutique hotel set in a historic 1913 building, renovated inside with light and bright contemporary designs. A full service terrace bistro and a bar with a balcony overlooking the vibrant PeachTree Street. Luxurious, comfortable and totally hip. Andaz Savannah, this urban contemporary hotel offers a pool, business and fitness centre. Large, modern rooms with city views and all the mod-cons. 22 Square offers delicious handcrafted cocktails and the food represents the flavours of the South. Relax on the sun deck poolside or head into the historical district. 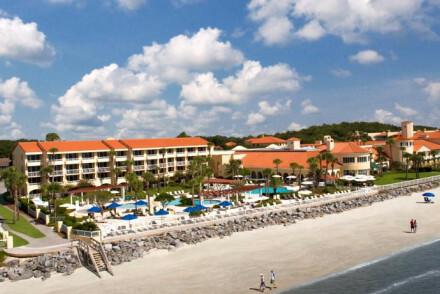 For the perfect setting, great golf, ocean views and friendly southern hospitality, try the King and Prince Beach and Golf Resort, St Simon’s Island. This upmarket resort comes with great restaurants, boutique shopping and offers eco-adventures for all the family. The Lodge At Sea Island regularly wins top hotel trophies as a premier hideaway resort for seekers of luxury and privacy. With distinctive architecture designed to recreate an English country manor, it also has that unmistakable feel of the heyday of the old South, not to mention two 18-hole championship courses. Also, interestingly, bagpipe lessons! 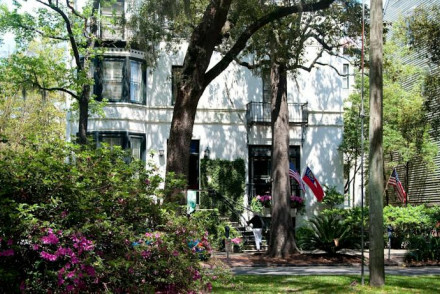 The Azalea Inn & Gardens in Savannah is a classic southern town house hotel,with pillars and porches, located in the Garden District easily walkable from downtown. The owners have a marvellous hospitality ethic and everything about it - from the shrimp-and-grits breakfast to the pool and fountain - is enticing. 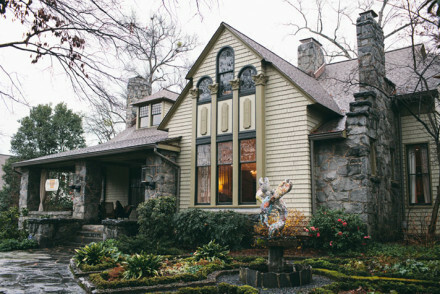 The Smith House is a traditional hostelry located in the Appalachian town of Dahlonega, and has been open for business since 1899 dispensing Southern hospitality. It prides itself on its home cooking; fried chicken, sweet baked ham, fresh steamed vegetables; homemade yeast rolls and corn muffins that melt in your mouth. What’s not to like? 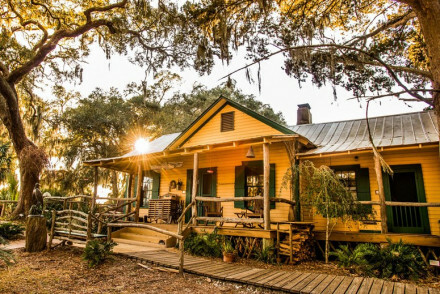 Greyfield Inn is a historic country house located on Cumberland Island - just a short distance from the beach. Elegant and traditional accommodation with ornate beds and Persian rugs. Wander around their 200 acres of private garden and breathe in the sea air! A simply stunning coastal retreat. Ideal for making the most of the great outdoors, The Stephen Williams House is a 1834 Federal mansion turned intimate boutique B&B, decked with antiques and in a prime location. All five rooms are unique, cosy and display an intimate charm. Breakfast is served at your convenience. A peaceful garden provides sanctuary after a day of exploring the fascinating historical Savannah. If you'd prefer a self-catering option this holiday - don't hesitate to visit our online partner Booking.com for a great range of properties to suit holidays of all types. Fly to Hartsfield–Jackson Atlanta International Airport located 13.5km (8.4 miles) from Atlanta with a wide selection of domestic and International flights. Alternatively, Georgia is well-served by Amtrak rail routes which connect the state to destinations all over the U.S.
Best time to visit - to make the most of the stunning natural assets, visit in Spring from March to May for pleasant temperatures and many of the state's festivals. Chic and stylish, a boutique hotel set in a historic 1913 building, renovated inside with light and bright contemporary designs. A full service terrace bistro and a bar with a balcony overlooking the vibrant PeachTree Street. Luxurious, comfortable and totally hip. A Coca-Cola top shop turned into a contemporary landmark on the heels of Jackson Square. Large rooms offer all mod-cons and city views, marble bathrooms and access to library, pool and business facilities. Pacci serves Italian cuisine and the bar is great for a nightcap. Explore by bike or on foot. Sights nearby - Washington Square is on your doorstep. 1834 Federal mansion turned intimate boutique B&B, decked with antiques and in a prime location. All five rooms are unique, cosy and display an intimate charm. Breakfast is served at your convenience. A peaceful garden provides sanctuary after a day of exploring the fascinating historical Savannah. Fishing - Head to Ossabaw Island for fishing, camping and trekking. Great walks - Forsyth Park for athletic tracks to jog or walk around. Sights nearby - Cathedral of St. John the Baptist. 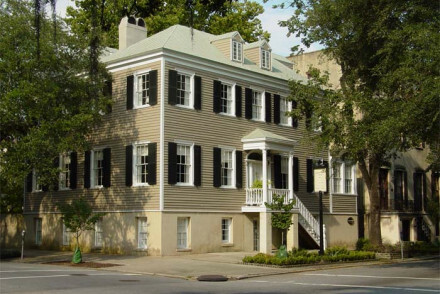 This B&B in the heart of Savannah Historical District is romantic and intimate. Unique rooms have four-poster beds, plush linens and private bathrooms. Breakfast is a southern affair for all guests. In the evening, the bar awaits. The great location is ideal for exploring the city on foot. Sights nearby - Oglethorpe Square is a hop and a skip away. This urban contemporary hotel offers a pool, business and fitness centre. Large, modern rooms with city views and all the mod-cons. 22 Square offers delicious handcrafted cocktails and the food represents the flavours of the South. Relax on the sun deck poolside or head into the historical district. Sights nearby - Jackson Square, Ellis Square and City Market are all on the doorstep. 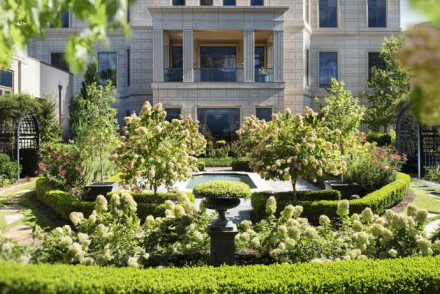 English manor inspired, activity driven and American-cuisine boutique is home to three championship golf courses as well as fitness and business facilities. Large rooms with antique furnishings and modern bathrooms. Steakhouse comes with an extensive wine list to explore. Activity galore! Sailing - Sailing lessons are a great way to get out into the ocean and hopefuly stay dry! Kayaking - Enjoy open sea kayaking with all the family. Intimate B&B in Midtown on a delightful leafy residential street, a converted 19th Century mansion filled with museum-quality artworks. The rooms combine historic elegance with modern amenities, and the front parlour has a grand piano and other fine furnishings. Quiet and unassuming yet luxurious. Italian style mansion come B&B in a residential and leafy part of town. Large rooms decked with antique furnishings, fireplaces, private balconies and modern bathrooms. In room breakfast as well as an evening glass of wine by the pool. 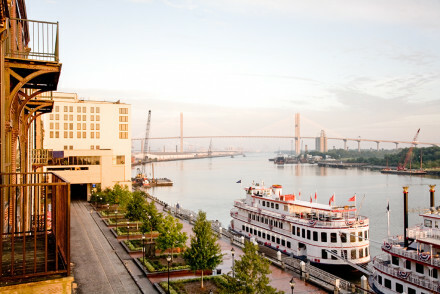 Great spot to explore Savannah at your leisure - foot or bike. Sights nearby - Mercer House is haunted (apparently) so head there to be spooked! 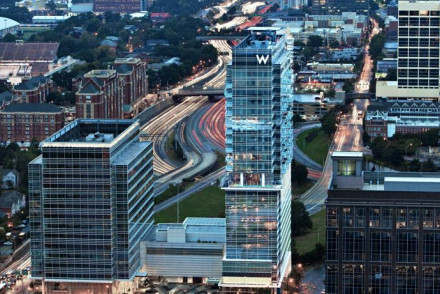 Trendy, elegant business and leisure hotel in the heart of Atlanta offers pool with a view, gym and business facilities. The rooms are modern with city views through floor-to-ceiling windows and modern bathrooms. BLT Steak matches traditional French bistro with an American steakhouse. Great spot! 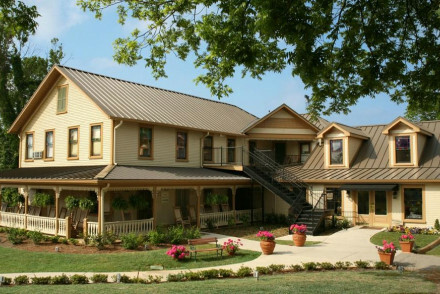 Sights nearby - Margaret Mitchell House and Museum is where the famous book Gone with the Wind was written. Seafront luxury resort with 18-hole golf course, five pools and endless sea and land based activities. Large rooms with all the mod-cons, ask for a sea view! Coastal cuisine served at ECHO Oceanfront complimented by handcrafted cocktails. Children have their own pool and endless activities for all. Sailing - Scallywag Sailing Tours offers dolphin, sunrise and sunset sails. Fishing - Shrimpin' aboard the "Lady Jane" with Captain Larry Credle. 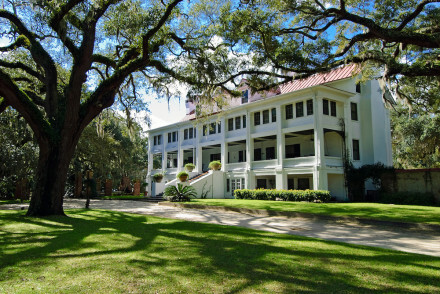 Great walks - Ghost Tours around Saint Simons Island. Secluded lodges hidden in a tranquil spot on Little St. Simons Island. Gorgeously traditional interiors create a cosy feel with fireplaces, antique furniture, wood panelled walls and animal wall mounts. Dining is a family-style affair with wholesome food served up on a long table. Rural bliss. Hideaway - Secluded and exclusive. A glorious rural escape ideal for total rejuvination. Families - Hire a complete lodge (or even the whole hotel) for intimate family holidays. Birdwatching - Located on the Atlantic Migratory Flyway, the island has wonderful birding opportunities. Fishing - Numerous opportunities for anglers in the surf, creeks or off the dock. Situated in Buckhead the Mandarin Oriental offers indoor pool, spa & all you need business facilities. Large rooms are classic in decor with modern bathrooms. The Cafe and Bar serve regional cuisine, Taipan whips up cocktails in an English garden setting. Location is simply perfect. Sights nearby - World of Coco Cola and CNN Centre both offer an insight into the big universal names. Great walks - Atlanta Botanical Gardens offers more than 30 acres of garden to explore. Active Holiday - Head off on a number of action-packed activities scattered all over the island. Sights nearby - Cathedral of Saint John the Baptist. Charming gold-rush era hotel opened in 1899 and offers an intimate, family-friendly stay. Rooms have a TV, private bathroom and comfortable beds. Family-style dining for all, which is hugely popular across town. Great spot for vineyards, bike tours and trekking as well as relax at the Jolie Day Spa. Local markets - Farmers Market every Tuesday and Saturday during the summer months.